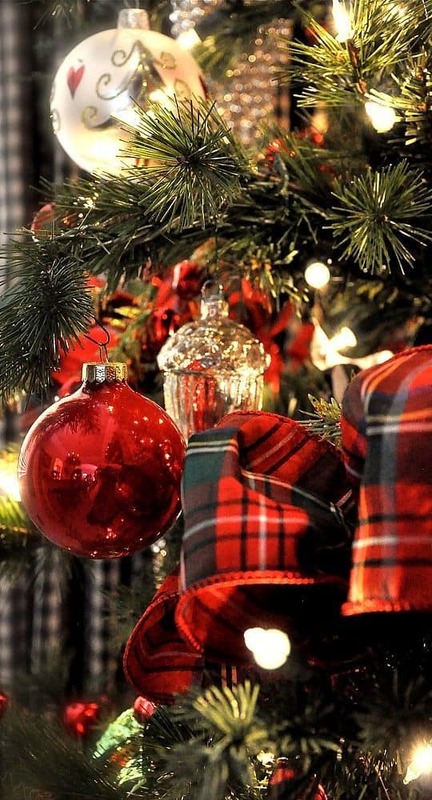 Christmas is on the way and so are its preparations and out of all Christmas trees are that one décor item which neither goes out of style nor gets old despite being in use for centuries. Along with the combinations of old fairy lights, ornaments and ribbons of all kinds that invite the magical holiday allure that we all pursue, the timeless presence can be nestled in any interior design effortlessly. Whether the Christmas trees are planted or potted emphasizing the festive feel around a home in no time, the Christmas trees outdoors can make any setting interesting. No matter how you choose to decorate your tree, be it a classic combination of red and gold or blue and silver or simply a bare one, raw animated by light only the piece will beautifully emphasize any setting, just make sure the about the presence in your setting. Use ribbons of red and gold along a combination of Christmas globes and poinsettias of the same color for a perfect combination. 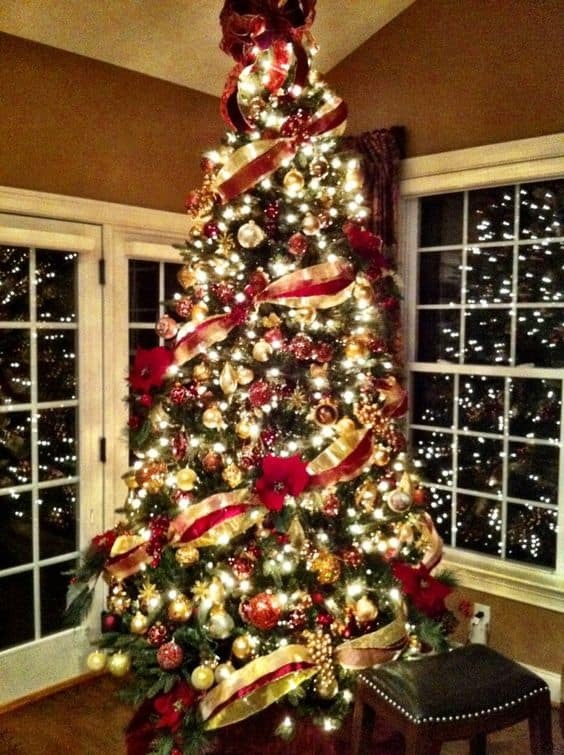 It might look dense compared to other Christmas trees yet the combination of gold and burgundy produces the Christmas feel that can fit in any house. With the wintery Christmas theme, gold and burgundy fits in well. When Christmas arrives, the home gets filled with festive decorations from the first step on the porch to the attic and while one might make the purpose of his / her life to avoid decorating with gold and red, most interior designs have the combination. The combination of burgundy and gold naturally compliment a Christmas tree and the natural deep green hue is adored by everyone. The dainty fairy lights add a beautiful red and enhances the lovely Christmas tree. The color combination of gold and red can let stand out anything perfectly on other solid colors, even on the combination of the same gold and red background. 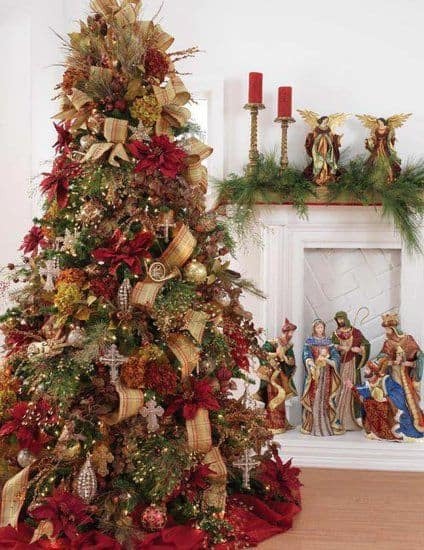 You can also use a setting of yellow and maroon in the background which will stand out perfectly because of the small elements which will become great focal in an elegant green mass represented by the Christmas tree. Use things smartly and wisely for the perfect finish. Poinsettias often wins the Christmas décor game as it has a strong presence in burgundy and red. The stunning flower brings out the festive feel from its lively hues whether it is artificial or fresh and emphasize with some rustic gold decors and simple warm white lights. Use burlap for beautifying the décor. Cascading the ribbon on trees can be a good option which creates a certain drama on your tree while placing ribbons around the Christmas tree is the classic way to go. Highlight the golden ribbon on top with a red star which serves as a visual delight. 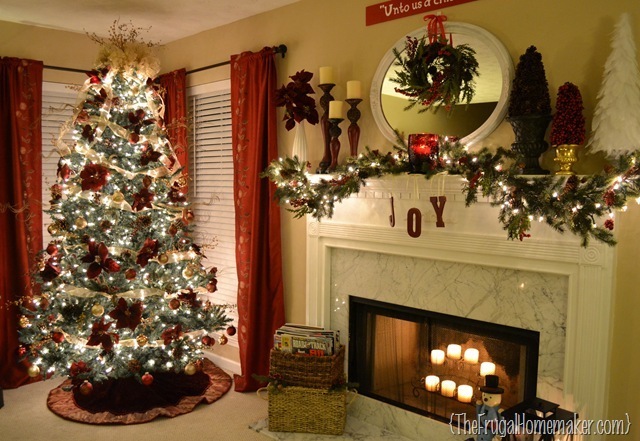 It is hard to get a clutter free Christmas tree and some may even consider them inexpressive which is boring yet the set up that follows clearly does not fall in this category. In a burgundy green mass, strong red Christmas globes shine, highlighted by warm light decorations shaping a very strong presence in a classical elegant setting. One that cannot receive clutter and requires simple elements which cannot be challenged. 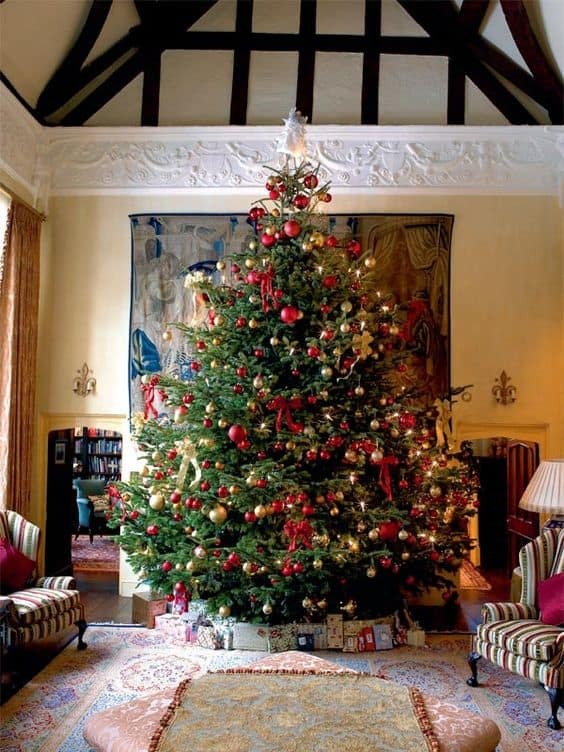 The English Manor inspired tree is splendidly timeless, especially with red– gold decorations. The variety of ornaments at different scales creates a wonderful emphasis on your tree through depth and the dainty burgundy ribbons around the tree are subtle but present, without any questions. 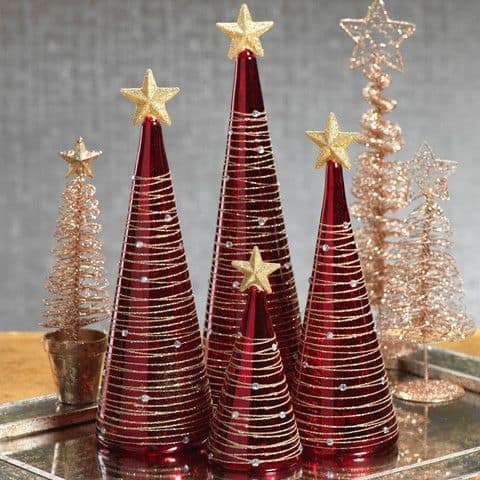 The larger, the better and this phenomenon works well with this gold and burgundy Christmas tree design. Without looking over crowded, the tree stands out in the room. 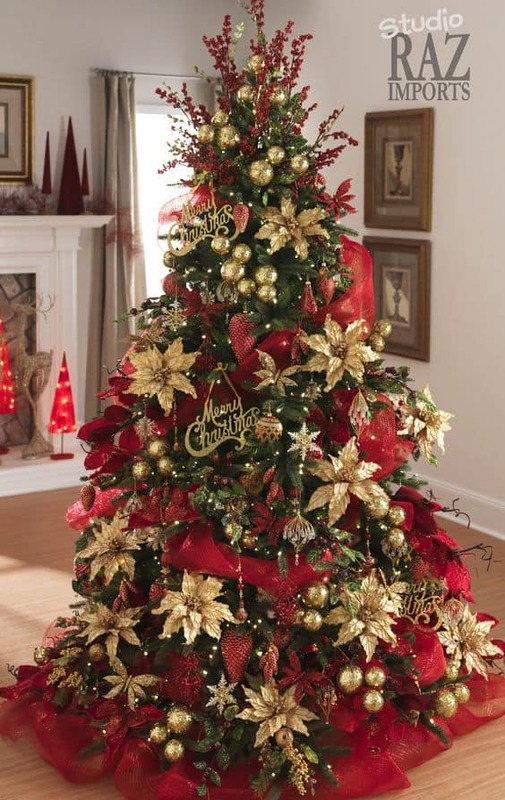 The solid gold and red décor creates a dramatic effect not only on your tree but the whole room. As a result, the variation is small, not to destroy one’s view. Simple and epic design. 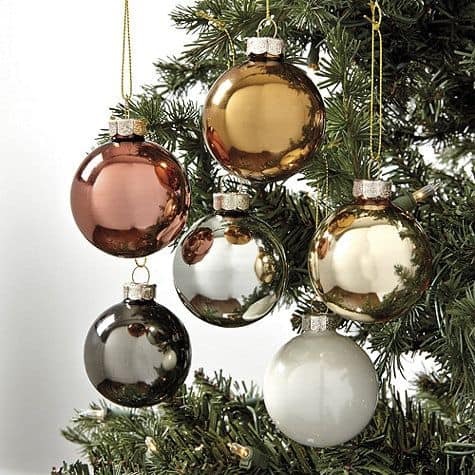 During the Christmas season, shiny globes are as common as snow men. A simple must, these decors are the perfect choice for a Christmas tree. The simple shiny globes are stunning when they are mixed properly in scale and color. While many of your friends and relatives would choose the glossy décor for the Christmas tree decoration, you must go for matte decors as it is a solid alternative which makes a Christmas tree look extraordinary. It creates a country feel which some shinier trees lack. 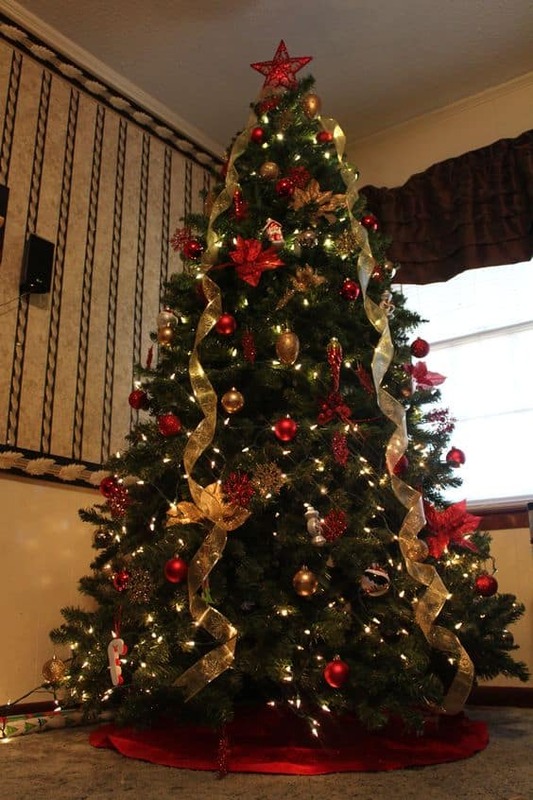 The design of a Christmas tree can be emphasized using simple lights here and there. Having a Christmas tree inside is essential but having another on in the yard makes your Christmas decoration complete offering a great Christmas allure for the inhabitants and pedestrians alike. 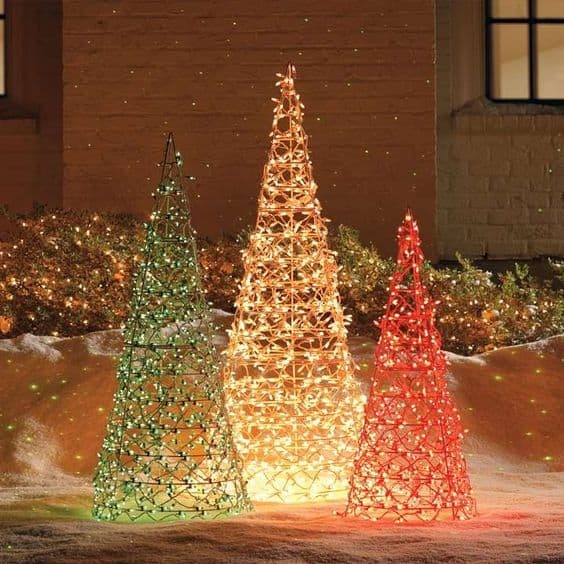 On a simple conic frame using simple lights, the simplified Christmas trees or red, green and gold brighten the yard without going over the top whilst creating a lovely effect along the snow. 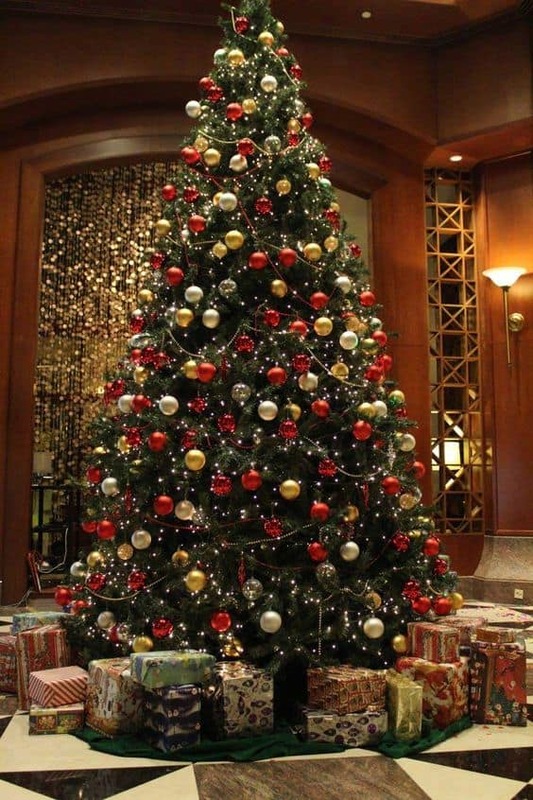 For gold and red Christmas tree, while the small decors are the usual trend, large décor pieces are also gaining popularity by choice these days. 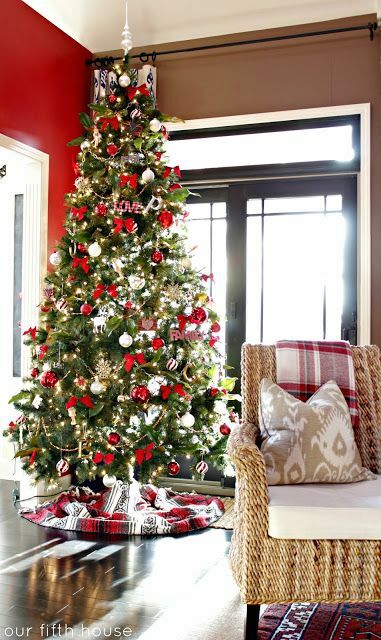 Besides from being a clutter free, larger designs create a different kind of classic touch on a Christmas tree in the change of scale as they stand out inviting your Christmas tree itself in the focus area of the one who sees it. Your Christmas tree might have all sorts of decorations yet the dominating piece will always be a Christmas globe. The uncomplicated, solid colors are high in graphic yet subdues to the natural beauty of your tree. The fairy lights and garlands accentuate the globes which makes the setting look shinier. You can get a real pine tree fit in your home if you are amongst some lucky ones or the usual commercial Christmas trees which are sold in stores in small spaces or with low budgets and here conceptualization is the key. A Christmas tree cannot be exiled in a home with no inhabitant. In such a scenario, simple reminders on the coffee table decoration or in the center piece can be of great help. To fit the holiday setting, a simple cone dressed to fit by a candle and a shower of string lights can be sufficient to invite the magical and charming allure of holiday. A Christmas tree is never complete without a topper and while a DIY craft can easily bring in an extraordinary result in this area, the classical ones which are found in retail never goes old. The burgundy mixed with gold will instantly become a focal point. 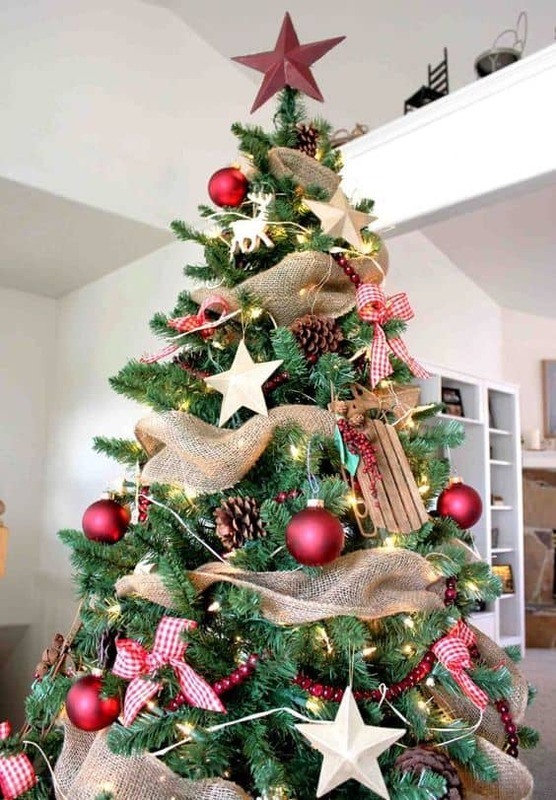 A burlap ribbon is good enough to create a lovely addition to the red and gold Christmas tree. A perfect texture is nestled between an extraordinary personal and graphic Christmas tree. A burlap ribbon supports a golden light with fairy lights while the large light red globes stand out beautifully complimenting the presence of green. This decor idea is a perfect one for those who are having kids at home. The gold and red decor never hurts the eyes and also matches up perfectly with the white walls of your home. The immense tree and the small decorations scale makes the decorating of a tree a perfect treat for kids as the process will last for hours in the hearts of family, friends and loved ones nestled between hot chocolate, orange, cider, cinnamon and a warm fire in the fireplace, a perfectly extraordinary experience. Use red and gold with sprays of pine cones, berries and the twirly branch stuff. Add a gold ribbon and add some lights. Decorate the tree with little champagne colored gold ornaments and some gold beadings. 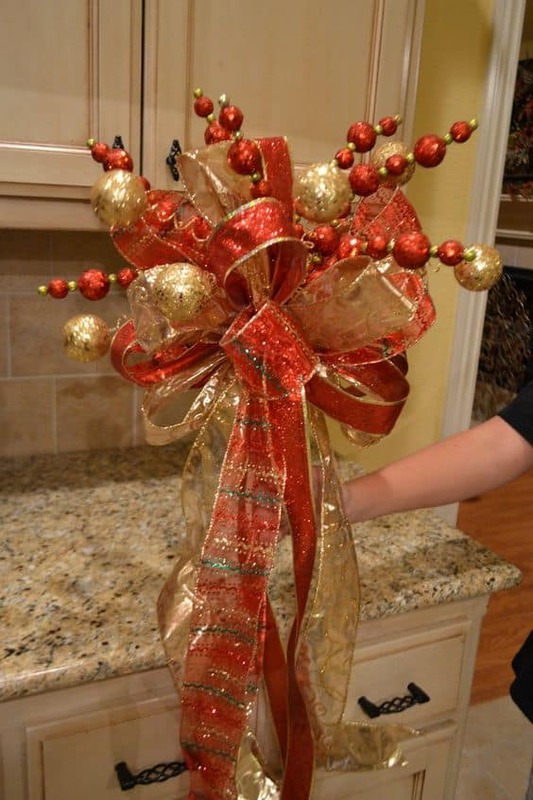 You can also use a glittery version of gold along with deep red poinsettias, gold sheer ribbon and some gold and burgundy balls. You can decorate it near the mantel. Try out the ideas and create something wonderful this season. Do not forget to include your family members and kids as they will surely going to love it. Use your own ideas and mix them up with the ideas above and watch out as you get marvellous results. There are a lot of possibilities in the field of decorations so keep trying and experimenting.